Author: Shauna LaTosky. Series edited by: Thomas Bierschenk, Anna-Maria Brandstetter, Raimund Kastenholz, Matthias Krings, Carola Lentz. Currently, ‘fast track’ modern development schemes are being implemented in southwestern Ethiopia, with enormous impact on the lives of local indigenous peoples. In this book, LaTosky looks at the predicaments of modern life in Mursiland, and reveals how Mursi (Mun) women experience and interpret the changes that are affecting their everyday lives. Based on ethnographic research conducted in northern Mursiland between 2004 and 2009, the author examines how Mursi women rhetorically express their conceptions of the past, present and future, and how they negotiate what it means to live well in a changing world. 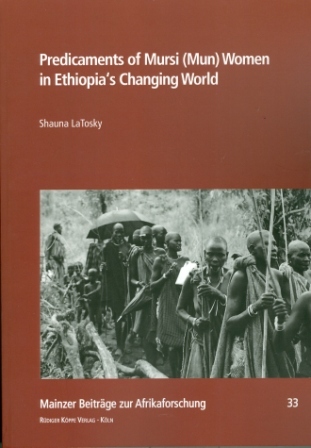 Drawing on the personal narratives of three generations of Mursi women, and analysing these stories within a framework of rhetoric culture theory and feminist rhetoric theory, LaTosky reveals the ambiguities, tensions and social contradictions that arise when an agro-pastoralist community is confronted by modern change. The book also considers how Mursi women’s experiences of being Mursi are shaped by their notions of gender, which in turn are shaped by rhetoric, and provides a critique of the universal enforcement of gender equality in the light of Mursi ideals of well-being. Shauna LaTosky studied cultural anthropology at the University of Victoria and received her PhD in social anthropology from Johannes Gutenberg University (Mainz/Germany) in 2010. From 2011–2013 she was Director of the South Omo Research Center and, since 2012, has been a post-doctoral researcher at the Max Planck Institute for Social Anthropology in Halle/Saale (Germany). Her current research interests include pastoralism and the environment, local knowledge, comparative customary law and conflict resolution procedures in southern Ethiopia. Die besondere Note gibt dieser Publikation der persönliche und doch wissenschaftliche Ton, die Einfühlungsfähigkeit der Ethnologin in die von ihr erforschte Kultur und ihre wissenschaftliche Stärke, Fehler und Missverständnisse, die sie zu Anfang ihrer Forschung in ihre Daten aufgenommen hatte, zu erläutern und mit wachsendem Wissen zu korrigieren bzw. zu relativieren. Besonders interessant sind ihre Beobachtungen zum Kulturkontakt, zu den nicht so offensichtlichen Formen weiblicher Rhetorik und Selbstausdruck sowie zu ihrem eigenen persönlichen Bewusstseinswandel. Aus diesen Gründen ist eine Lektüre auch für nicht mit Südäthiopien beschäftigte WissenschaftlerInnen sehr zu empfehlen.